Donkey Motorsports - Just Silly Power!! 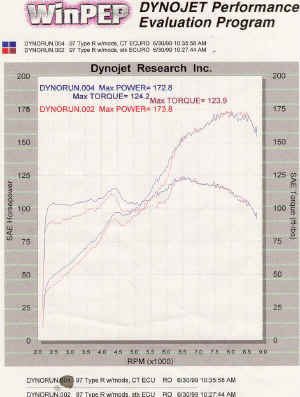 This page is where you'll be able to find the various dyno runs for our cars. As you can see it's still very rough. Something to remember is that these runs are on different dynos with wildly varying test parameters. The results are really only a way of showing relative gains within the same session. This run was on Mike's car with mostly basic bolt-ons on a VERY hot Sacramento summer afternoon. That's why the lines are so jagged. The combination of the shaved head and high intake temps was causing the ECU to juggle the ignition advance to combat detonation. At the time the car had the Realtime head, Comptech header, AEM intake, and HKS exhaust. 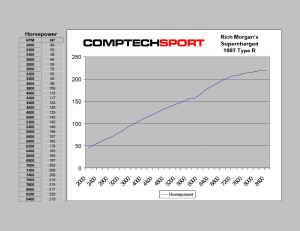 The test was with the prototype Comptech ECU. Unfortunately I can only find the text version of the stock ECU run, but you can still see from the plot the Comptech ECU increased the low end a good deal. 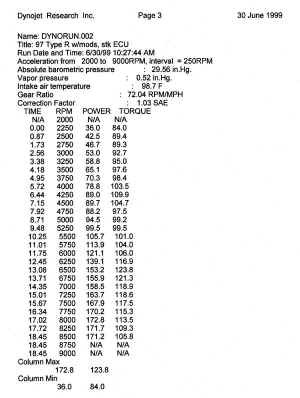 Pretty interesting since most upgrades don't do much to help the low end torque of Honda motors. 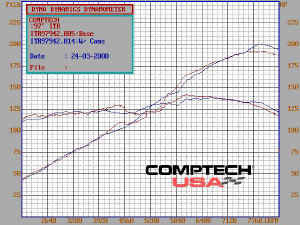 This one is Rich's latest run on the Comptech dyno. Talk about some linear power delivery. Here's Mike's last run with the Toda Spec B's installed. The difference between the two runs included the new cams, Crower springs and Ti retainers, and swapping out the AEM cold air intake for a Comptech short pipe and Uni-Filter. Only cam timing adjustments were made at this time. No fuel or ignition mods were made. Strangely enough the first runs with the AEM showed a good loss on the low end. Switching to the shorter intake seemed to alleviate this. Also when the cams were installed we found that the number one cylinder had a bent intake valve and was suffering about 30% leak down. With that in mind it was decided that the serious tuning should wait until the valve problem can be corrected. Stay tuned though, as Mike has a fresh head with some new tweaks on the way. * I think there's a lot of untapped potential in these cams. With the new head and some serious tuning larger gains should be possible.